I bear about me daily the keenest sense of their weight, and that feeling prompts me now to lift my voice. 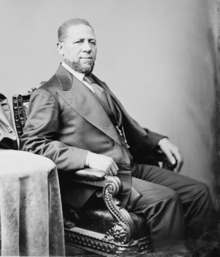 Hiram Rhodes Revels (27 September 1827 – 16 January 1901) was a Republican U.S. Senator, minister in the African Methodist Episcopal Church (AME), and a college administrator. I bear about me daily the keenest sense of their weight, and that feeling prompts me now to lift my voice for the first time in this council chamber of the nation; and, sir, I stand today on this floor to appeal for protection from the strong arm of the government for her loyal children, irrespective of color and race, who are citizens of the southern states, and particularly of the State of Georgia. I am well aware, sir, that the idea is abroad that an antagonism exists between the whites and blacks, that that race which the nation raised from the degradation of slavery, and endowed with the full and unqualified rights and privileges of citizenship, are intent upon power, at whatever price it can be gained. It has been the well-considered purpose and aim of a class not confined to the south to spread this charge over the land, and their efforts are as vigorous today to educate the people of this nation into that belief as they were at the close of the war. It was not uncommon to find this same class, even during the rebellion, prognosticating a servile war. This page was last edited on 23 October 2018, at 22:27.